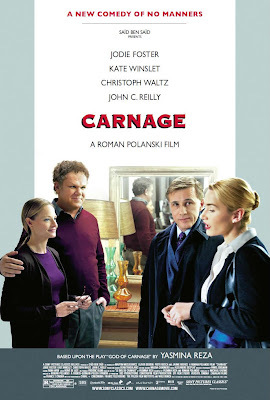 Mendelson's Memos: Review: Carnage (2011) is amusing, but predictable and uninspired. Review: Carnage (2011) is amusing, but predictable and uninspired. There is nothing terribly wrong with Carnage, Roman Polanski's adaption of the play God of Carnage. But it's story, which involves two couples who meet to discuss the playground injury that one child inflicted on another, plays out exactly as you'd expect it to. It's fun while it lasts (and it's an awfully short picture), but the picture contains little insight and an unfortunate predictability, both in the actual narrative and in the casting, that it renders the final product very-nearly pointless. Thanks to an unfortunate need to cast exactly-to-type, the film even loses much of its appeal as an acting treat. It's not a bad picture, and it's entertaining while it's being watched, but it's almost obscenely inconsequential. The biggest problem lies in the casting. If I told you that one couple is relatively wealthy while another lives in a cramped apartment/townhouse, and then I told you that the four cast members are Jodie Foster, Kate Winslet, John C. Reilly, and Christoph Waltz, I bet you could tell me who each actor plays. And, after having guessed correctly, I'm willing to bet that you'd be able to correctly predict the character arc of these four respective characters with 70-90% accuracy. By casting four unquestionably strong actors, but having them merely play the very role we expected them to, in exactly the manner we expected, Polanski robs the viewers of the inherent fun of seeing famous actors go against type. Now casting for or against type is usually not that big of an issue, but when the entire film is basically an acting exercise, you're sacrificing a major source of entertainment value. The film does indeed feel like a staged play, as the action basically never leaves the main room where our four parents discuss their respective child's actions. However, we do actually see the incident in question, which also robs the film of any kind of ambiguity and operates as a brazen cheat, since we now have information that the parents are not privy to (I'm told that the original play keeps the inciting incident offscreen). Once the 'conversation' has begun, the rest of the film unfolds as expected, with accidental gaffes, misunderstandings, shifting of alliances and sympathies, and an eventual quasi-resolution that basically highlights how pointless the whole film actually was. Despite the above misgivings, the picture is entertaining and genuinely fun, and the acting is solid even as the actors almost feel like they are slumming (Golden Globe nominations aside, Jodie Foster and Kate Winslet can do this material in their sleep). Despite its big-screen release and the general preference that movies be seen in a theater when possible, Carnage is arguably the sort of film that feels far more at home as a DVD rental than something justifying the time and expense of a big-screen adventure. It's not a bad film, it's just an uncommonly slight film, especially when you consider the inordinate talent involved in bringing it to the screen.